Tickets will go on sale from 9:30 a.m. - 3 p.m., Wednesday and Thursday at Holmes High School for the Lady Bulldogs vs Conner game. The teams will play at 7 p.m.,, Friday, at Northern Kentucky University. The Bulldogs set the tone early, attacking and forcing turnovers to take a quick 7-2 lead before St. Henry could match their aggressiveness. The Crusaders rebounded from their tough start and cut the margin to 22-19 after being down by as many as nine points. But the Bulldogs managed to stretch the lead to 28-21 at the half. Junior guard Kamari Graham played a significant role for Holmes in the first half. She knocked down four 3-pointers to score 12 of her game-high 14 points. The Bulldogs opened the second half with an 11-0 run to expand their lead to 39-21. Six of the 11 points came from senior guard Laila Johnson in a stretch that seemed to put the Crusaders away. St. Henry managed to pull within eight points with just under four minutes remaining in the game, but Holmes used its pressure defense to pulled away once again at the end. 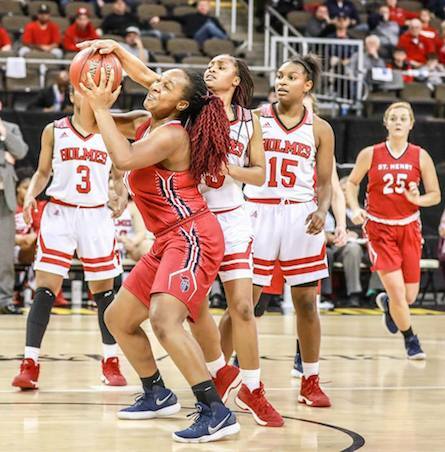 The Bulldogs, who have now won sixth straight games and eight of their last nine, will play a familiar opponent in a regional semifinal game against Conner at 7 p.m. Friday. Holmes knocked off Conner in the regional semifinals the last two years, but the Cougars won the regular season game between the two teams last January. HOLMES (20-7): Lovell 1 0 3, Johnson 4 0 10, Graham 4 2 14, Keith 0 2 2, Stowers 5 1 11, Englemon 3 5 11. Totals: 17 10 51. 3-pointers: H — Graham 4, Johnson 2 Lovell. SH — Flanagan. Dixie Heights (22-9) vs. Newport Central Catholic (11-17), 7 p.m.
Ryle (25-6) vs. Holy Cross (18-12), 8:30 p.m.
Holmes (20-7) vs. Conner (23-8), 7 p.m. Winners of Tuesday’s games, 8:30 p.m.